Hank Trimble (l) and Kathy Navejas who has been seen in the city since the 2015 election. After former HG Police Chief Walter McKinney was rejected as City Manager, Navejas, according to documents, defamed Councilwoman Myra Maravilla in a Facebook post. 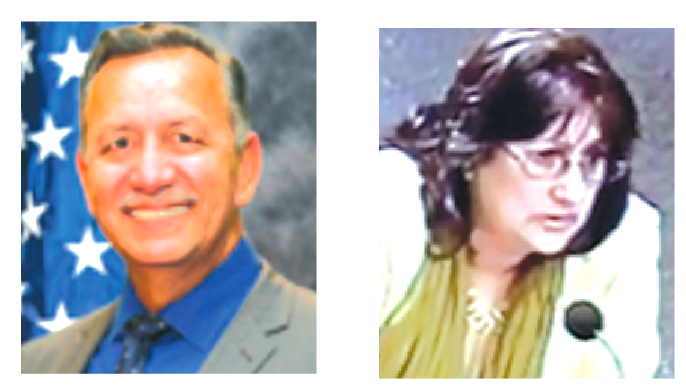 A Hews Media Group-Community News investigation has revealed that Hawaiian Gardens Councilman Hank Trimble received $1,000 in campaign donations from recalled and disgraced former Hawaiian Gardens Councilwoman Kathy Navejas for his successful 2015 City Council campaign. Campaign documents showing the $1,000 donation from Kathy Navejas to Hank Trimble in Sept. 2015. Click on image to view larger document. The campaign documents were obtained via a public records request from the Hawaiian Gardens City Clerks office. In addition, the documents show that Terryl Bruce, the wife of embattled Hawaiian Gardens Mayor Barry Bruce, was Trimble’s campaign Treasurer, furthering the cozy relationship between Trimble and Mayor Bruce. Campaign documents showing Terryl Bruce as Trimble’s campaign Treasurer. Click on image to view larger document. Navejas gave Trimble the $1,000 in September 2015 and marked the donation as an individual with an address of 14449 Gleaners Rd. in Kingman, Arizona. An internet search reveals that the Gleaners Rd. address is 30 miles east of Kingman, AZ., about 3 miles off of Interstate 40 on a dirt road in an extremely desolate area. The nearest gas station is 17 miles away and the nearest restaurant is 30 miles away in Kingman. A Google map does show a building at the address, and Zillow lists the structure as a 2,960 square foot manufactured home. The area is so desolate no Google or Bing street images are available. 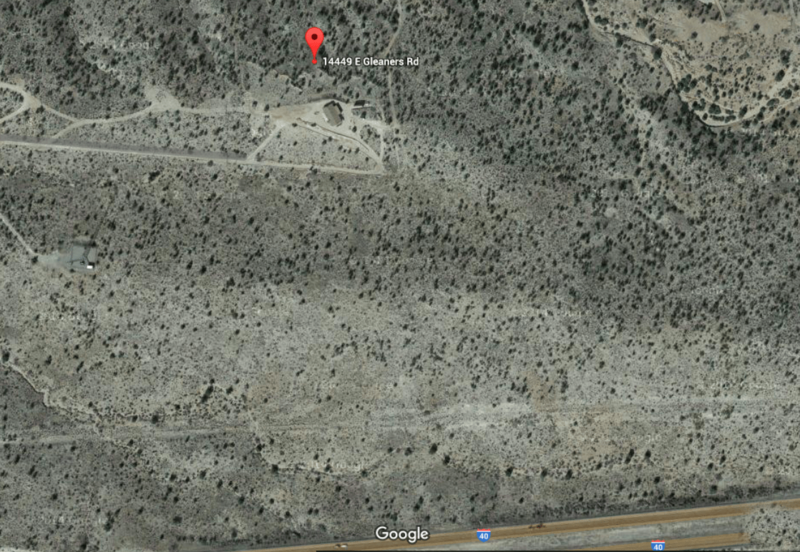 The location of a manufactured home, just below the red pin, presumably owned by Navejas at 14449 Gleaners Rd in Kingman Arizona. Click on image to view larger map. The address is also the “principal address” for Angels Ranch Development Services, LLC, an Arizona company established on June 1, 2010; the Registered Agent on file is Navejas. No other information exists on the LLC. The campaign documents also show that current Hawaiian Gardens Mayor pro tem Reynaldo “Rey” Rodriguez gave $200 to Trimble’s campaign on Oct. 2, and Hawaiian Gardens based Tacos San Pedro donated $500. Campaign documents showing Hawaiian Gardens Mayor pro tem Rey Rodriguez’ $200 donation to Trimble. Click on image to view larger document. This is not the first time questions have surrounded a Trimble City Council campaign. HMG-CN exclusively reported in 2011 that Trimble’s wife Kathy registered to vote within the City of Hawaiian Gardens six months prior to the Nov. 2011 Hawaiian Gardens City Council election. Kathy Trimble was backed by Navejas and Mayor Bruce but lost her election bid. Now Hank Trimble will come under fire from residents and others for accepting the largest single donation from Navejas, whom a majority of Hawaiian Gardens’ residents despise. It was first reported by HMG-CN weeks ago that Navejas, along with Mayor Bruce and Mayor pro tem Rodriguez, wanted to hire convicted felon and former Hawaiian Gardens Police Chief Walter C. McKinney as the City Manager. Bruce scheduled an unusual 3:30 pm meeting on a Friday to vote for McKinney but was rebuffed by the union and residents in a contentious meeting. It looked as if Bruce had lined up three votes: himself, Rodriguez, and Trimble, but later on in closed session McKinney was not hired. Sources told HMG-CN that both Rodriguez and Trimble, seeing the union reaction, had second thoughts. HMG-CN has emailed HG City Attorney Kendra Carney of Woodruff, Spradlin and Smart for clarification. Councilwoman Myra Maravilla was incensed at the meeting. Maravilla read a letter during public comment blasting the situation caused by Bruce, Rodriguez, and Navejas. She also referenced the harassment at City Hall after the Dec. 2015 election, and the apparent disregard of the situation by Trimble. Navejas did not waste any time in slamming Maryville, possibly defaming and libeling the Councilwoman in a Facebook post, while praising the actions of Mayor Bruce and others. Screenshot of Navajos’ Facebook post. Click on image to view larger document. 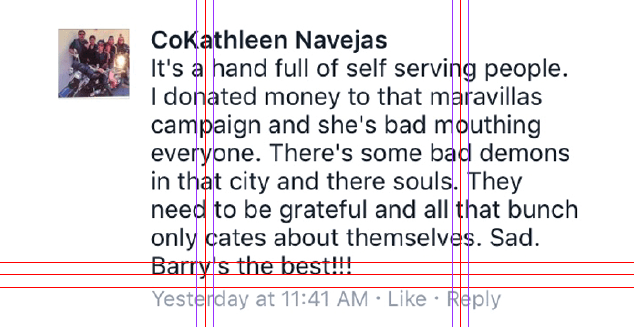 HMG-CN obtained Councilwoman Maravillas’ campaign documents that showed Navejas did not give money to Maravilla. Click on image to view PDF of all of Maravilla’s campaign documents. Law.com defines defamation as the act of making untrue statements about another, which damages his/her reputation. If the defamatory statement is printed or broadcast over the media it is libel. Public figures such as Maravilla have to show that the defamation was made with malicious intent and was not just fair comment. It is unknown whether or not Maravilla will sue Navejas, but according to the definition it appears she has good cause to sue. The local unions are not taking this lightly, voting unanimously two weeks ago to recall Bruce from his position, and possibly Rodriguez. HMG-CN sent an email to Trimble with no response.